Robin Hill is a lovely and surprisingly spacious 15th century hall house, famous for having two of England's finest timbered and straw plastered bedrooms, in one of Britain's most photographed streets and opposite the world-renowned Mermaid Inn. It is beautifully furnished, very well-equipped and can easily and comfortably accommodate 12 guests. The large, quiet and secluded garden is shaded by a wonderful mulberry tree. At the foot of the cobbled street, yachts and pleasure craft lie moored alongside medieval warehouses full of bustling antique shops. Rye delights the eye with its wealth of old buildings, its church and tower. Restaurants, pubs and cafes abound and offer excellent food within easy walking distance of the house. Rye Bay plaice and scallops are provided by the picturesque local fishing fleet. Description of the house: This delightful house displays its original beams, high ceilings and rooms full of character and surprise. The upper living room is especially light and sunny, contains a bar and projects into a secluded garden complete with a large mulberry tree set against a panorama of ancient rooftops. The lower living room with its inglenook fireplace looks out onto the famous cobblestone street and the magic of Rye. One bedroom still has its grooves for the original medieval wooden shutters. The whole house testifies to a bygone era and has been dated to 1480. Within this medieval setting a fascinating variety of Asian artefacts has been imaginatively displayed ranging from an antique rickshaw to Chinese ancestral doors. Location and town of Rye: Situated 1.5 miles from the open sea and nature reserves, Rye is within easy reach of Brussels, Paris and London. Canterbury is only one hour away by car. Rye is probably the most complete example of a medieval town in Britain and crowns a hill originally surrounded by the sea. Its 12th century church, fortified tower, Landgate and ancient wall are all within easy walking distance of the house and bear testimony to its history as a Cinque Port. Robin Hill was the origin of the ballad 'There's an old-fashioned house in an old-fashioned street' and formed the basis and front cover design of Beatrix Potter's 'Tale of the Faithful Dove.' Mabel Lucy Atwell lived, wrote and illustrated here and one of the publisher-owner's many literary guests, E.F Benson, the novelist famous for his creation of 'Mapp and Lucia,' gave the house its name - 'Robin Hill'. Leisure facilities: Three miles beyond Rye are Camber Sands, ideal for children, and Winchelsea, which is a lovely example of medieval town planning. 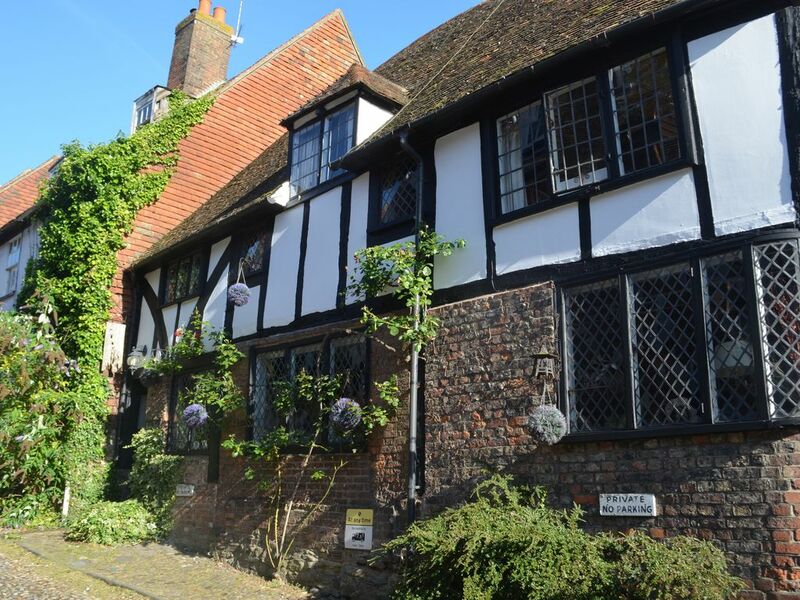 Rye has good sporting and sailing facilities, splendid walks and excursions into the smugglers' paradise of Romney Marsh and the delights of rural Sussex and Kent. A wildlife bird sanctuary stretches from Rye Harbour to Fairlight. Rye also boasts some excellent eating houses. We can recommend The Fish Cafe, The Union Steakhouse, The Tuscan Kitchen (Michelin starred, bookings essential), Fletcher's House, The Gandhi Tandoori, The Globe Inn, The Hope Anchor, The Lemon Grass, The Mermaid Inn bar, Simply Italian. There are many other possibilities from among the numerous cafes and pubs in Rye. We have lived for many years in Kuala Lumpur and Hong Kong. Asia has proved a fascinating destination for many of our travels. This Grade 2 listed house has been a constant source of interest and delight. We continue to learn about former residents - back to 1680 so far - and to welcome friends and family to a home which we feel privileged to occupy for a short time in its long history. We have much pleasure in inviting you to share this experience with us. A truly medieval environment in the very special town of Rye with its fishing fleet and yachting berths. A home from home with all the comforts. An excellent range of small shops for gifts to suit a vast range of tastes: pottery, paintings, books old and new, leather, antiques of every description, glass, specialist kitchen ware, furniture, clothing, shoes. The first floor bathroom contains a bath, a shower attachment for hair washing, a wash basin and a toilet. There is also a separate first floor toilet. On the ground floor there is a shower room with a bidet, a wash basin and a toilet. The twin bedroom and 1/f lounge also have wash basins. Large and seating 10 easily with electric cooker and toasters. Fridge, dish washer, clothes washer and dryer in the scullery adjoining the kitchen. The dining room has a rosewood table seating 10 and a round oak table which can seat 4 easily. Additional chairs can easily be brought in from the kitchen. The bar in the 1/F lounge incorporates a lift-up counter hiding a wash basin. The twin 1/F bedroom also has its own wash basin. The 2/F family room contains 1 double and 1 single bed. There are also two single fold-out chair beds on 2/F in a library/lobby at the top of the stairs, although this is not entirely private. G/F shower room includes a toilet. 1/F bathroom includes a toilet. There is also a separate 1/F toilet. The kitchen is large, extremely well equipped and has a mahogany table seating 8 people easily. The electric cooker has a double oven and 4 ceramic hobs. The dining room is also spacious seating 10 people at its handsome teak wood table. The house is on a hill. Shops and historic attractions are within 3 minutes' walking distance. Rye is located between Hastings and Folkestone and is a mile and a half from the coast. From London Rye can be reached either via M20/A2070/A259 through Ashford or via M25/A21/A268 through Hawkhurst. Historically known as '1066 country' the surrounding area provides the visitor with an abundance of castles, abbeys, fortresses, National Trust gardens and houses, and museums. The coastal area is noted for its flora and fauna including a wildlife bird sanctuary: marshland stretches eastwards, a haven for smugglers in bygone days, and the haunting seascape of Dungeness is a habitat for a wide variety of unusual plants and dominated by two lighthouses; to the west stretch the unspoilt beach of Winchelsea and the cliffs of Fairlight Country Park.